Another First for William Loughnane! A SPECIAL Olympic gold medallist has become the first person in the country with Down Syndrome to pass his driving test. William Loughnane (26), from Clooney-Quin, Co Clare, got rid of his L plates after recently passing the theory and driving test. His latest achievement has been hailed by Pat Clarke, the president of Down Syndrome Ireland. Mr Clarke said that to the best of his knowledge William was the first person in Ireland with Down Syndrome to hold a full driving licence. 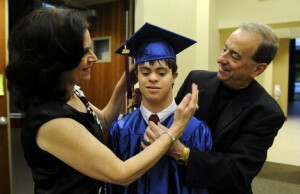 “For people with Down Syndrome it shows that if they persevere they will get to where they want to get to,” he added. William, who works in a Centra shop in Ennis, won two gold medals, three silver and two bronze for gymnastics at the 2003 Special Olympic games in Dublin. Four years later, he claimed six gold and one bronze medal in China. His father Liam helped him with the principles of driving. “I showed him the ropes. He only started in November,” Liam said.